Some of the birds referred to in this post. Clockwise from top left - Bombycilla garrulus, the Bohemian waxwing, Bombycillidae; Chaetoptila angustipluma, a Hawaiian honeyeater; two true honeyeaters (Meliphagidae), Anthochaera carunculata (red wattlebird) and Prosthemadera novaeseelandiae (tui); and Moho nobilis, the Hawai'i 'o'o, a Hawaiian honeyeater. Painting by John Anderton. Fleischer, R. C., H. F. James & S. L. Olson. 2008. Convergent evolution of Hawaiian and Australo-Papuan honeyeaters from distant songbird ancestors. Current Biology 18: 1-5. GrrlScientist brought my attention yesterday to an interesting new publication on the phylogeny of the Hawaiian honeyeaters. Not, I hasten to explain, the Hawaiian honeycreepers, the Drepanidini clade of birds unique to Hawaii that has become famed for their remarkable adaptive radiation into a whole range of ecological niches, but a smaller clade of five species, Chaetoptila angustipluma and the four species of 'o'o (Moho), that is also unique to Hawaii. 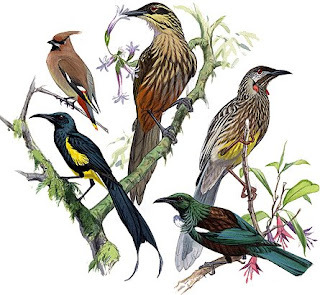 The honeyeaters of the family Meliphagidae are a sizable, fairly heterogenous assemblage of songbirds (Oscines) that are found throughout the Australo-Papuan region, with outliers on various Pacific islands such as New Zealand and Samoa. Despite including a diversity of morphologies, meliphagids are well established as a family, united by features such as a brushed tongue used for taking nectar from flowers (hence, of course, the name "honeyeaters"). The five Hawaiian species share many of these features, and are fairly similar in appearance to Australasian meliphagids, so have always been regarded as meliphagids themselves. The study being discussed here found in a DNA phylogenetic analysis that this was not the case. Conducting a molecular analysis of Hawaiian honeyeaters is a remarkable achievement in itself because, tragically, not one of the five species remains alive today. All became extinct in the last two centuries. The last surviving species was the smallest, the Kauai 'o'o (Moho braccatus), the last male of which was sighted in 1987 (just to turn the pathos up a notch, a short video of this last individual can be seen here). The Hawaiian honeyeaters therefore join an all-too-long list of birds extinct on the Hawaiian islands since human colonisation, such as the moa-nalo. In the absence of living specimens, Fleischer et al. had to extract DNA from museum specimens, but were able to do so for all five species. Phylogenetic analysis of these samples showed that, as mentioned above, Chaetoptila and Moho were not related to the true meliphagids. As I've explained elsewhere, recent molecular analyses have consistently identified three large clades within the songbirds (as well as a smattering of smaller clades), the Meliphagoidea (including the meliphagids), Corvoidea and Passerida (including most Northern Hemisphere songbirds). The Hawaiian honeyeaters are not members of the Meliphagoidea, but instead belong to an entirely different clade, the Passerida. Within the Passerida, they belong to an assemblage that includes the Holarctic waxwings (Bombycilla), North American silky flycatchers (Ptilogonatinae) and Caribbean palmchat (Dulus dominicus). Most authors have united these birds in the family Bombycillidae, and the name was recently used in this sense by Spellman et al. (2008). While Fleischer et al. (2008) establish a new family Mohoidae for the Hawaiian honeyeaters, that clade would belong within Bombycillidae in the broad sense. Relationships of the Bombycillidae within the Passerida remain largely unresolved. The Hawaiian honeyeaters have not been the first birds to abscond from the Meliphagidae in recent years. I have previously discussed the discovery that the New Zealand stitchbird (Notiomystis cincta) is related to the New Zealand wattlebirds, and perhaps a basal member of the Corvoidea. The South African sugarbirds of the genus Promerops, long unsettled as meliphagids, belong to the Passerida and are basal members of the Passeroidea assemblage that includes finches and sparrows (Beresford et al., 2005). The Bonin honeyeater (Apalopteron familiare) is also a member of the Passerida, and falls within the family of white-eyes, Zosteropidae (Driskell & Christidis, 2004) - which I wasn't too surprised to hear because, if you ignore the "meliphagid" brushed tongue, Apalopteron really does look like a big white-eye. Still, the Hawaiian honeyeaters are probably the most typically "meliphagid-like" birds to be recognised as non-meliphagids. In another interesting recurring theme in oscine phylogeny, the reclassification of Hawaiian honeyeaters, while morphologically unexpected, makes a certain degree of biogeographic sense. Most colonisation of the Hawaiian islands seems to have been derived from North America rather than the western part of the Pacific, with Hawaiian honeycreepers, warblers, geese and violets, among others, all having demonstrated North American (and often northern North American) affinities. As pointed out by a commentator at GrrlScientist's post linked to above, the only Hawaiian bird that still possesses western Pacific affinities is the monarch flycatcher Chasiempis sandwichensis, whose Monarchidae affinities were supported by Filardi & Moyle (2005). Puka kana keiki he Kukuluae'o, lele. Its offspring was a Kukuluaeo [stilt, Himantopus knudseni], and flew. --Hawaiian text from here, 1897 translation by Queen Liliuokalani. Peale (1848) provided no common name for Chaetoptila angustipluma when he first described it (as Entomiza angustipluma - Entomyza is a meliphagid genus). Bryan & Greenway (1944) gave the name "kioea" for this species, but with a question mark, and they also used the name elsewhere for the curlew - I haven't been able to find whether this is the first recorded association between the name and Chaetoptila. Not only has Chaetoptila been cruelly forced out of existence, but it has potentially been subjected to the indignity of a name that is not its own. It truly is the unknown honeyeater. Beresford, P., F. K. Barker, P. G. Ryan & T. M. Crowe. 2005. African endemics span the tree of songbirds (Passeri): molecular systematics of several evolutionary ‘enigmas’. Proceedings of the Royal Society of London Series B – Biological Sciences 272: 849-858. Bryan, E. H., Jr & J. C. Greenway Jr. 1944. Check-list of the birds of the Hawaiian islands. Bulletin of the Museum of Comparative Zoology 94 (2): 92-140. Driskell, A. C., & L. Christidis. 2004. Phylogeny and evolution of the Australo-Papuan honeyeaters (Passeriformes, Meliphagidae). Molecular Phylogenetics and Evolution 31 (3): 943-960. Filardi, C. E., & R. G. Moyle. 2005. Single origin of a pan-Pacific bird group and upstream colonization of Australasia. Nature 438 (7065): 216-219. Peale, T. R. 1848. Mammalia and Ornithology. C. Sherman: Philadelphia. Spellman, G. M., A. Cibois, R. G. Moyle, K. Winker & F. K. Barker. 2008. Clarifying the systematics of an enigmatic avian lineage: what is a bombycillid?. Molecular Phylogenetics and Evolution 49 (3): 1036-1040. It is good of you to identify the birds in the illustration, and thanks for linking your Stitchbird post too! Finchwench is too modest to note here that she broke the story on her blog (which see!) first. Is that a Bohemian waxwing on the upper left? We have those in Anchorage--they're everywhere.